We report that two seemingly similar variants of Tn antigens have very different conformations in water. 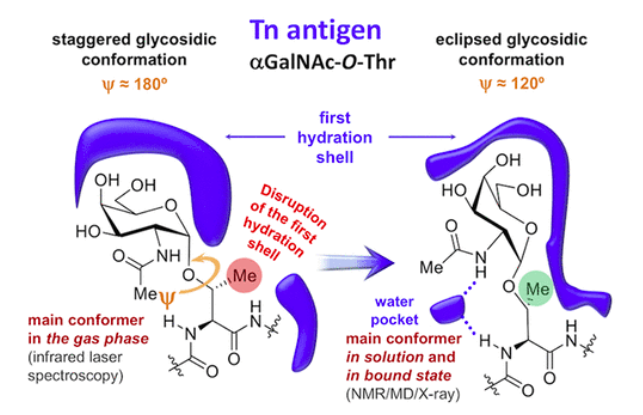 Using interdisciplinary approaches, both experimental and computational, the team showed that the threonine-linked Tn antigen assumes a rigid form in solution and forms a persistent water pocket. In contrast, the serine-linked Tn antigen lacks the water pocket and is flexible in solution. These differences were not observed in gas phase studies. The different Tn antigen conformations are likely to result in distinct interactions with cellular receptors and antibodies and understanding these structures may facilitate the design of more effective screening tools and anticancer drugs. 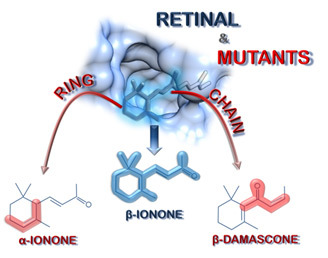 The investigation has been published in JACS. Emilio J. Cocinero was invited to the 10th edition of the Isolated Biomolecules Biomolecular Interactions “IBBI 2018”. He presents several studies about the elucidation of biomolecule structures (carbohydrates and glycopeptides) through high resolution spectroscopies. In the photo, IRID spectra of Tn-Thr* and Tn-Ser* Antigens presented at the talk. 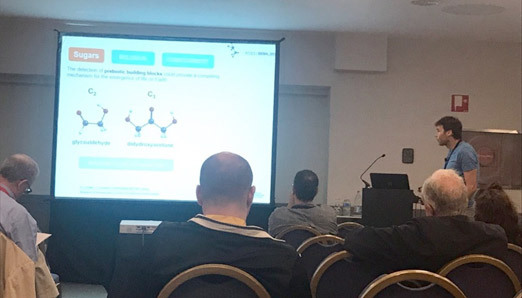 Carlos Martí-Gastaldo gave a great talk about MOFs titled: “Charge transport and photo-activity in Metal-Organic Frameworks: Ultrathin Films and Porous Crystals” and David González about Supramolecular Chemistry: “Hierarchical Supramolecular Construction of Self-assembled Nanotubes by Coupling Cooperative Effects”. 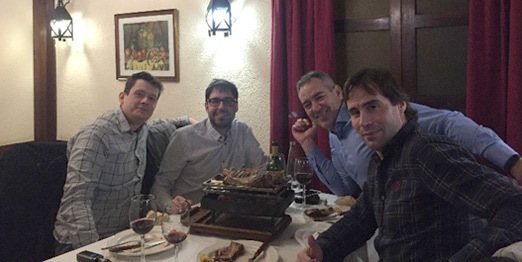 In the photo from left to right, Carlos Martí-Gastaldo, Aurelio Mateo-Alonso, David González and Emilio J. Cocinero enjoying T-bone steak!!! We report the potential of state-of-the-art rotational technique (recently built at the University of the Basque Country) with an extended molecular analysis of three biomolecules combined to quantum chemical calculations and crystallized data comparison. The results are impressive: more than 8000 transitions have been assigned, corresponding to the rotational structures of 54 different species (3 molecules, 14 conformers and 40 isotopologues). 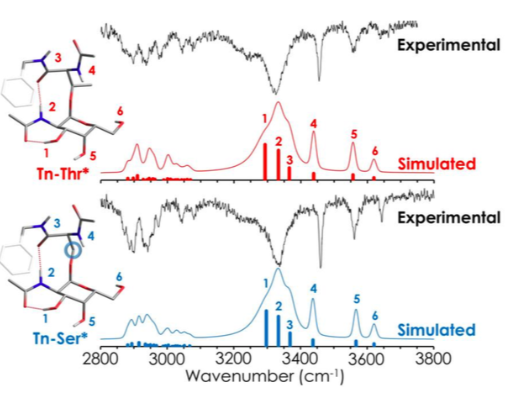 In addition, methyl internal rotation dynamics were also observed and analyzed. The investigation is being published in J. Phys. Chem. Lett. 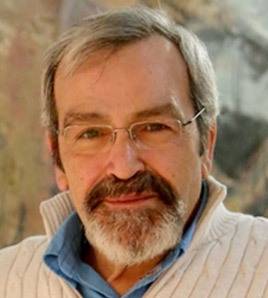 Emilio J. Cocinero joined a new Biofisika Institute (CSIC – UPV/EHU) and it has been awarded with 3.572.296 € by 3 years by Basque Government as part of Basic Research and Excellence Centers (BERC program). We have been awarded a 3 years project financed by MINECO that also includes a Ph. 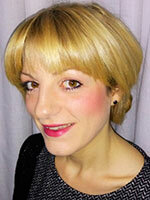 D. Scholarship to develop our research. 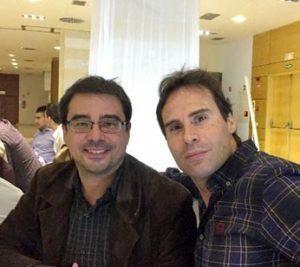 Prof. José Cernicharo at Instituto de Ciencias de Materiales de Madrid (CSIC) gave a wonderful talk titled “Las moléculas y el polvo a través del ciclo de vida de las estrellas”. He talked about his new European Project. We could also discuss about future collaborations.